Hayes freshman Mary Grace Duffy delivers closing arguments to the judges in the case, played by local attorneys, Friday. Duffy said she enjoyed participating in the competition and learning about how the court system works. 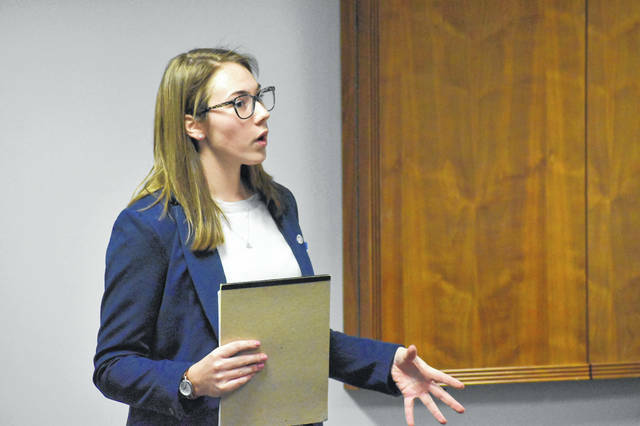 Hayes High School sophomore Mackenzie Collett cross examines a witness during the mock trial competition Friday at the Rutherford B. Hayes Administrative Building in Delaware. Collett played an attorney in the case and had to represent both sides throughout the day. Collett and other attorney competitors questioned witnesses, introduced evidence, objected, and gave closing arguments. 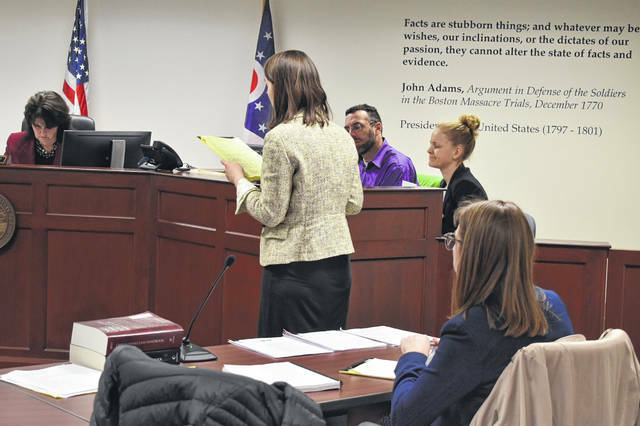 The Delaware Hayes High School Mock Trial team is moving onto regionals after winning the trials competition Friday at the Rutherford B. Hayes Administrative Building in Delaware. Delaware County Common Pleas Judge David Gormley coordinated Friday’s event and said the teams had to represent both sides of a fictional case. This year, the case centered around a criminal defendant challenging the admittance of a piece of the state’s evidence. Gormley said in the fictional case, a privately operated drone appeared to show the defendant outside next to a notebook with incriminating evidence written on it.